Brette Caslake has a unique gift: she can see and hear ghosts. When a former classmate asks her for a favor, she visits the RMS Queen Mary. The ship carried hundreds of war brides from Europe to American after World War II and is rumored to be haunted. When Brette digs into the past, she makes unexpected discoveries about two women who roomed together on that voyage. Simone Devereux became an orphan when her father died for the French Resistance and now she is going to meet the wounded American who fell in lover with her. Her roommate on the ship is Annaliese Lange, a German ballerina who still seems to be looking over her shoulder. In A Bridge Across the Ocean, we have another historical fiction/present day story. Meissner does this dual narrative better than most writers. The stories of Simone and Annaliese in particular are very well-written. I would have read an entire book about either one of them and anxiously turned pages to find out what happened to them. Both women faced horrible things during the war and the end of the war doesn't necessarily mean the end of danger. In the present, we witness Brette dealing with her ability to interact with ghosts. A dual narrative story with ghosts would usually be just the thing to make me put a book aside, but Meissner pulls it off with aplomb. While you may not be convinced that ghosts exist (much less interact with people), Brette's difficulties make it clear just how much it could mess up your life if they did. 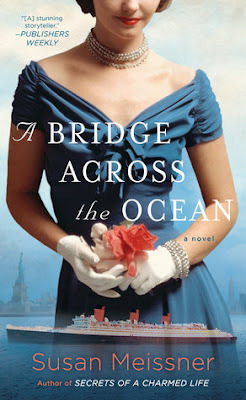 A Bridge Across the Ocean is a great addition to the shelves of historical fiction fans. The focus on war brides' brave journey to a new country to be reunited with husbands they hardly knew is a unique and compelling one, and there are plenty of twists and turns to keep you reading until the final secret is revealed. I tried to get this from Netgalley but sadly was turned down. Its always geographical restrictions. Sounds such a good book for historical fiction fans. Sounds like something I'd enjoy (i love historical fiction). I might try getting this on Netgalley, but I doubt I'll be approved, so I'll look out for this title from publishers & in the bookstore.